ww2dbaseConrad Emil Lambert Helfrich was born to a Dutch father and Indonesian mother in Semarang on the island of Java in the Dutch East Indies in 1886. He joined the Dutch Navy in 1907 and participated in the Dutch intervention in Bali in 1908. He graduated from the Naval War College in Den Helder in the Netherlands in 1922. As an instructor at the war college in 1923, it was said that he speculated that the next great naval war would be fought between Japan and the United States, and major points of contention would be Pearl Harbor in the Hawaiian Islands, the Panama Canal, and San Francisco on the west coast of the United States. In 1931, he was made the Chief of Staff of the naval forces at the Dutch East Indies. In 1935, at the rank of rear admiral, he was made the commander of a squadron in the Dutch East Indies. In Oct 1939, he was made the commanding officer of all naval forces in the Dutch East Indies. In Aug 1940, he was promoted to the rank of vice admiral. When the Pacific War began, he sent the few submarines he had under his command on aggressive patrols against the Japanese, resulting in more sinkings of Japanese vessels than what the British and the Americans achieved together. Meanwhile, he lobbied relentlessly for a unified Allied command in the Pacific war area, in which he was successful, but he failed to attain the naval command position in the American-British-Dutch-Australian (ABDA) command formed in Jan 1942. Instead, the job went to, at least in Helfrich's opinion, the far too conservative American Thomas Hart. When he was finally able to convince the coalition leadership to take on an offensive, replacing Hart as the ABDA naval commander in the process, he had lost the little initiative that the Allies had in the theater. Furthermore, his decision to engage in the Battle of the Java Sea further eroded Allied strength in the region. By the end of Feb 1942, overwhelming Japanese forces had effectively destroyed ABDA, and Helfrich escaped Java in a Catalina aircraft on 2 Mar 1942, eventually relocating his headquarters to Ceylon. Although he held the title of Commander of the Armed Forces in the East (ie. Dutch East Indies), his command had no real military strength and thus he played no further major role in the war. Instead, he spent his efforts planning for the possible return of the colonial administration in the Dutch East Indies. In 1945, he was promoted to the rank of lieutenant admiral (a rank equivalent to a full admiral in US and British navies) and was given command of the Dutch Navy. On 2 Sep 1945, he was present aboard USS Missouri in Tokyo Bay in Japan, representing the Netherlands in the Japanese surrender ceremony. He returned to the Dutch East Indies in Oct 1945, becoming the commander of all Dutch forces in the colony until Jan 1946, when the position was abolished. He retired from military service in Jan 1949. He published his memoirs in 1950. He passed away in the Hague, the Netherlands in 1962. Kent Budge, "The Pacific War Online Encyclopedia"
11 Oct 1886 Conrad Helfrich was born in Semarang on the island of Java in the Dutch East Indies. 31 Aug 1940 Conrad Helfrich was promoted to the rank of vice admiral. 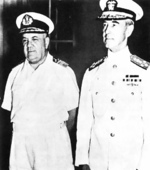 12 Feb 1942 Conrad Helfrich was named the commander of the ABDA naval forces in the Pacific. 2 Mar 1942 Conrad Helfrich escaped Java, Dutch East Indies by Catalina aircraft. 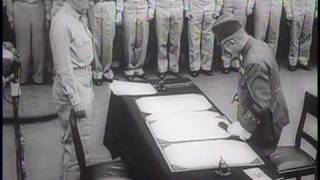 2 Sep 1945 Conrad Helfrich signed the Japanese instrument of surrender aboard USS Missouri aboard Tokyo Bay in Japan on behalf of the Netherlands. 1 Oct 1945 Conrad Helfrich returned to the Dutch East Indies. 24 Jan 1946 Conrad Helfrich's position as the Commander of the Armed Forces in the East (ie. Dutch East Indies) was abolished. 1 Jan 1949 Conrad Helfrich retired from the Dutch Navy. 20 Sep 1962 Conrad Helfrich passed away in the Hague, the Netherlands.